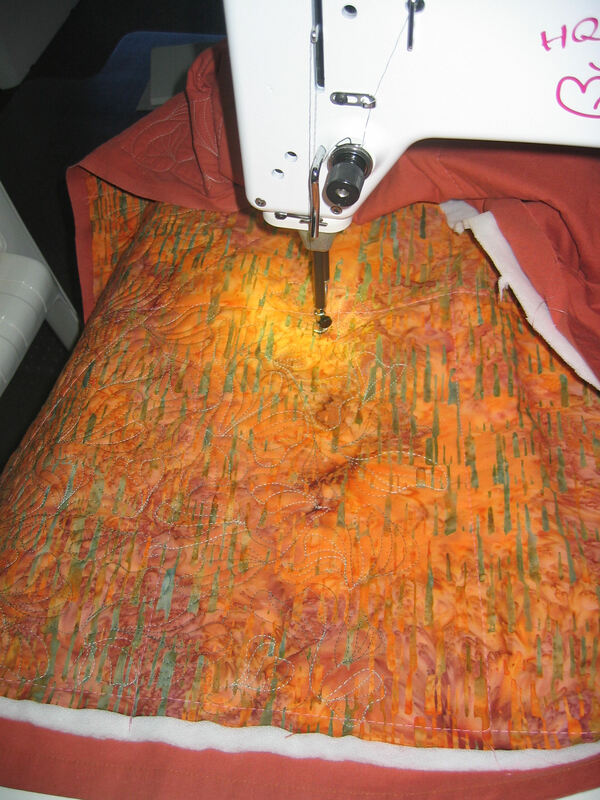 After playing with the HandiQuilter (HQ) Sweet Sixteen quilting machine at the Eleanor Burns Quilting Academy in March, and after really putting it through its paces when a friend lent me hers, I’ve now purchased my own machine! As an aside, just before I picked up my machine, Michelle and her team at Handcrafters House were named HandiQuilter’s International Dealer of the Year, beating some 750 dealers in 10 countries for that award, which is based partly on sales but mostly on customer support and training. Congratulations, Michelle and all your team! 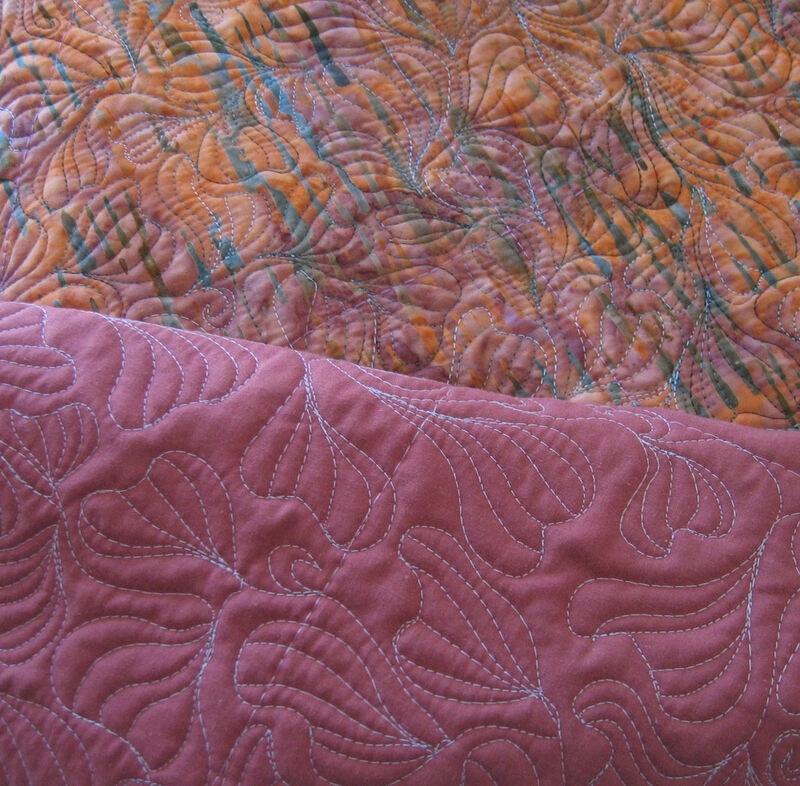 The quilting motif I’ve used on that square metre of orange batik is based on the crocus designs from Leah Day and her free motion quilting project. It’s a design I find really easy to do and is a great filler design for all sorts of large and small areas. Well I’ll Bee! 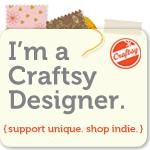 Wow, your freemotion designs look amazing. I hope you have lots of fun with your new machine. WOW! 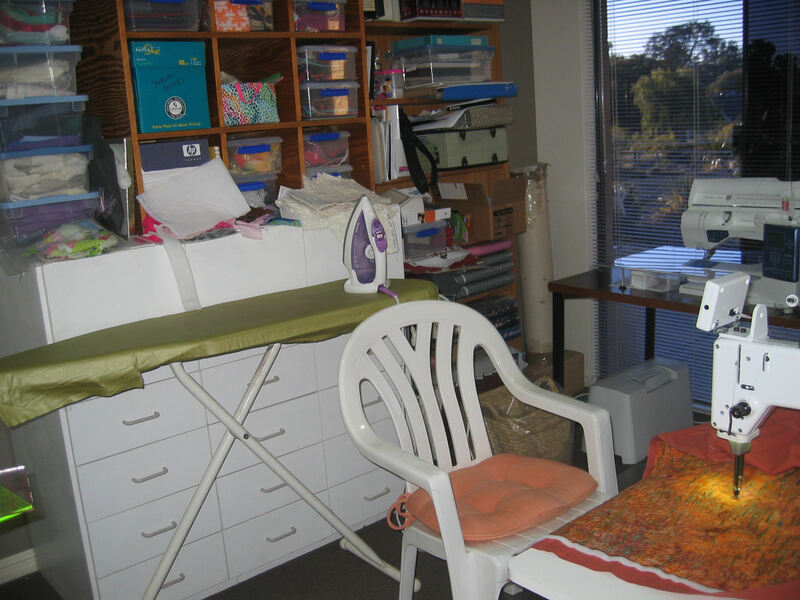 Rhonda – your quilting looks bloody brilliant! Well done – seriously, there is no holding you back now! So impressed! Oh – heavens – you must be so delighted – you have done wonderfully. Bee must be running hot!! 🙂 Great going Rhonda! I haven’t encountered any stickiness on the table at all. However, I have added a Super Slider to the needle area because I don’t like the little ridge between the table and the machine — the Super Slider smooths out that ridge. 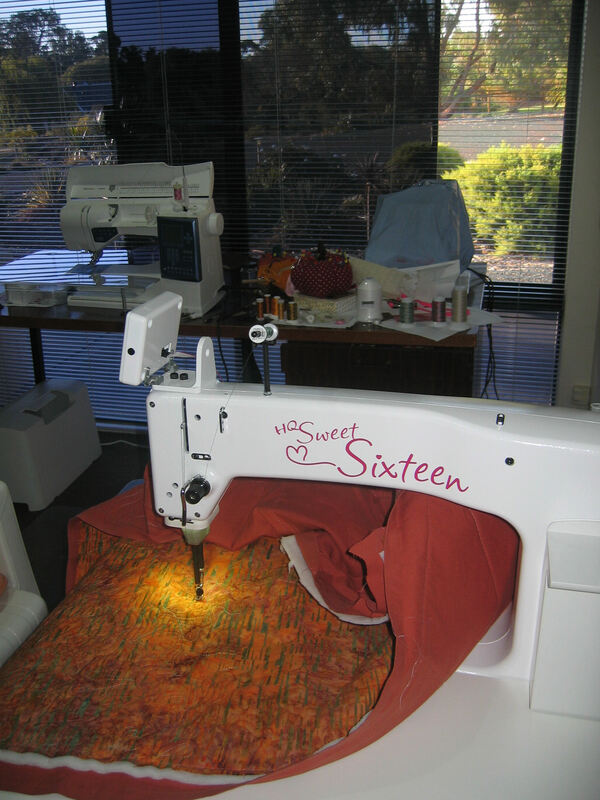 I just used an old one I had from my domestic sewing machine and taped it to the table a few weeks after getting annoyed with the ridge (I tried taking the rubber feet off the machine and raising the machine to the edge of the table with paper where the feet went, but that didn’t work out). Maybe the stickiness you’ve encountered at the dealer’s is a result of too many people using the table and the staff not cleaning it properly. Perhaps someone on staff sat a bottle of oil on the table and a few drops ended up drying on the table — I never put the oil bottle on the table before or after use, just in case. 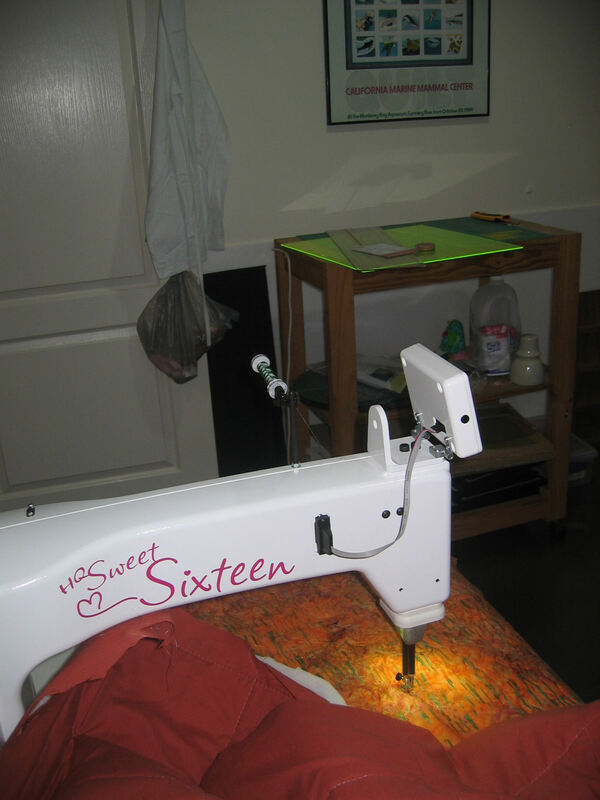 Oh, and I’ve tried several Sweet Sixteen machines with their tables — at the workshop in California, my friend’s loan machine, at my dealer’s, as well as my own — and none have been sticky.